Never again will a blinking—12:00! 12:00! 12:00!—clock need to be set. Never again will a tracking wheel be fiddled with to stop static from messing up an already pretty terrible picture. Never again will we blow into a machine with the hope that it might make the aforementioned terrible picture .00002 percent less terrible. 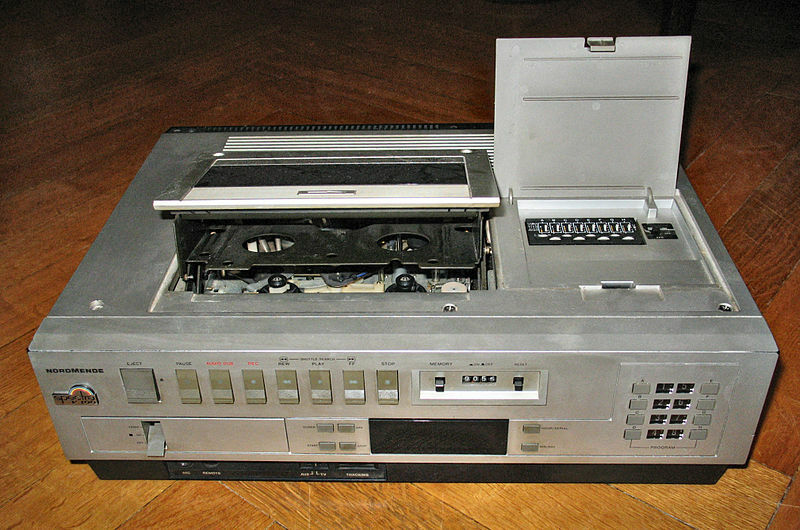 VCR technology existed since the 1950s, but it wasn’t until the 1980s that the machines became affordable to regular folk. When I first learned of their power, my little legs buckled contemplating the new world that was about to open up for me: so, even though we are stuck in traffic coming home from grandma’s house, this thing will allow me to watch the new episode of Family Ties and not wait 8 months for the re-run? And hold on, I can watch movies in my house? Over and over again? And I can watch R-rated ones without having to sneak past an usher? And even though my parents won’t let me stay up late enough to watch the mini-series V, I can “tape it” and watch the baby get born with a lizard tongue tomorrow morning during breakfast? It’s amazing, in retrospect, how convenient it seemed to be able to get movies from Blockbuster Video. Today I get annoyed scrolling through Netflix and Hulu searching for "something good," and I don’t even have to be wearing pants while I do it. In the VCR times, you had to drive to a store (wearing pants) with the full knowledge that there was a 99 percent chance that the movie you wanted to rent wouldn’t be there. And you were fine with that! Conan the Barbarian is out? Fine, I’ll try whatever the hell Time Bandits is. Who cares? It's a movie in my house! No Gus, that isn’t the answer, but given our current domestic and global political climate, not the worst advice.